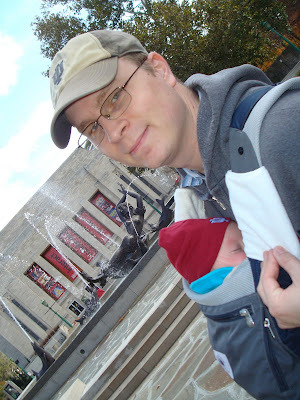 Last weekend I was fortunate enough to get to take Simon to Bloomington for the first time. I just love IU’s campus. We took some pictures around campus. Here Simon is saying hi to Herman B. Wells. We also went to the IU vs. Northwestern game. I played in the alumni band, which was so much fun. I forget during the year how much I like playing the trombone. The game itself was kind of depressing. More than half the crowd left during the 4th quarter we were loosing so bad. Simon didn’t like the game much at all. Too loud for him. He fussed through most of the game, and as soon as we exited the stadium and it was quieter, he got so happy. Vince and I covering the babies ears. We also got to meet Clara for the first time, and see Charlie as a big kid. I love that I get to see my best college friends at least once a year. These guys are the best.